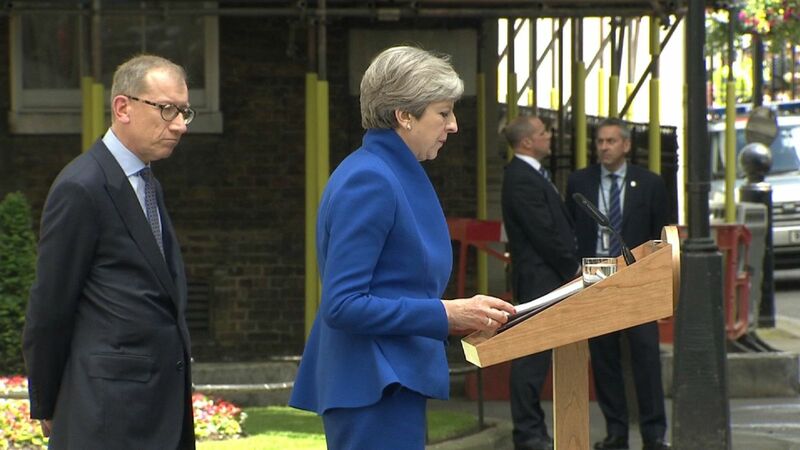 Theresa May has pledged to form a government that can "provide certainty and lead Britain forward at this critical time". Facing down calls to stand down by Labour and the Lib Dems, a defiant Mrs May asserted only the Conservatives and the DUP have "the legitimacy and ability to provide that certainty by commanding a majority in the House of Commons" having secured the largest number of votes and the greatest number of seats in the General Election. She and her team have spent the last several hours trying to produce a small working majority in coalition with the Democratic Unionist Party. She said the two parties had enjoyed "a strong relationship" over many years. "This gives me the confidence to believe that we will work together in the interests of the whole United Kingdom," she said. "This will allow us to come together as a country and channel our energies towards a successful Brexit deal that works for everyone. "That's what people voted for last June. That's what we will deliver." DUP MPs are meeting to discuss the situation and one told Sky's senior political correspondent Beth Rigby earlier: "we would consider a supply and confidence arrangement to make sure Theresa May has sufficient support to keep her in government". In return for shoring up the Tory majority the party has demanded considerable more resources for Northern Ireland, more influence and involvement in trade deals. A formal agreement is yet to be reached. Britain has a hung parliament after the Conservatives lost their majority on an extraordinary night. The Tories remain the biggest party with 318 seats so far and Labour currently have 261 - with 326 required for a majority and just one seat left to be called. Labour leader Jeremy Corbyn has called on Mrs May to resign, declaring he is "ready to serve the country" after Mrs May's snap General Election gamble spectacularly backfired - and a much better than expected poll for his party. However, he has refused to be drawn on whether he would form a minority government.